We’re about to grab some lunch and then head up to beautiful Bellingham, Washington for the opening reception of Angela’s show at Western Washington University. 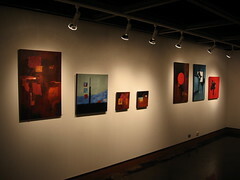 It’s a great gallery space, and her work looks fantastic there. ← Look how cute, the acolyte!